From 1867 through to Canada’s last hanging December 11, 1962 there were 710 executions in Canada. Capital punishment was for many years hotly debated across the nation and eventually abolished in 1976. There were three executions in the Northwest Territories, the first was Albert Lebeau in 1921, the second Victor Beaulieu in 1952 and the last was carried out on June 1st, 1954. It was more than a year prior to that date that Fred Cardinal was charged with murdering his wife Mary Rose Cardinal. Fred and Mary Rose were residents of Arctic Red River (now Tsiigehtchic) (map) where Fred was an RCMP Special Constable. On the morning of May 7, 1953 Cardinal came into the Arctic Red River RCMP detachment and claimed that his wife had died during the night of natural causes, apparently a heart attack. Constable Komaike, the officer in charge of the detachment, then went to the Cardinal residence to investigate and he found Mary Rose lying in bed with no obvious signs of how she died. Fred then began preparations for burial. Constable Komaike began to suspect that this might not have been a natural death after all. Residents of Arctic Red were claiming that Mary Rose was, prior to her death, in good health so Constable Komaike decided to call in his sergeant from Aklavik. With the only radio in Arctic Red broken Komaike was forced to make a quick dog sled trip to Aklavik and he returned by plane with Sgt McLaughlin and Dr. Otto Schaeffer. By the time they got back Mary Rose’s funeral was about to begin but Dr. Schaeffer insisted on making a close examination of the body and he found blood coming from her ear. It was obvious that Mary Rose had been shot. At trials held in Aklavik in July 1953 and in Yellowknife in January 1954 jurors heard that Cardinal had been having an affair with a woman in Arctic Red and also heard how he had confessed to the murder on several different occasions and to several different individuals. Cardinal’s defence, handled by an experienced lawyer from the south, was based on a claim that Cardinal didn’t remember committing the crime and was temporarily insane at the time. The jury spent what was described as ‘much less than an hour’ to return with a verdict of guilty as charged. 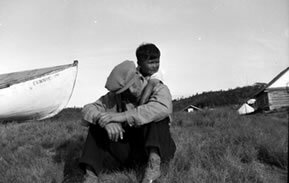 The judge sentenced Fred Cardinal to death by hanging and he was led to gallows on June 1, 1954.in Fort Smith, NWT.